Interview: George Ezra on his debut album, 'Wanted On Voyage'. He has a scar on his head which can be credited to Marky Ramone. He has slept a night in a Parisian hospital because he ran out of money for a hostel. And he placed fifth in The BBC's Sound Of 2014 poll. You should really become accustomed with the "he" that is George Ezra. On the way to Copenhagen as we spoke, this boy is both literally and metaphorically going places. Since the release of his single, 'Budapest', George has already completely sold out his UK tour and is set to release his debut album in a few weeks. "The only thing you can ever ask for is that… somehow my music can fit into somebody's memory. If it can be the soundtrack to somebody's happy days then that would be amazing." COUP DE MAIN: Hey George! I'm stoked to be able to talk to you today - how's your day been going? GEORGE EZRA: Yeah all right! We're driving to Copenhagen at the moment. CDM: So really busy touring and travelling then - that's awesome. GEORGE: Yeah! I love it. CDM: You've cited Bob Dylan and Woody Guthrie as some of your musical inspirations, but at the same time there's something inherently modern about your music - how do you merge that older blues and folk sound with living and growing up in the 21st century? GEORGE: I guess it's kind of the obvious thing for me to do 'cuz it's what I grew up listening to. The songs growing up and everything kind of seem like old music to them, but to me, it's just… good music. And of course I did grow up in England in the 21st Century and that does come into it as well. CDM: You took a voyage around Europe shortly after you signed your record deal, how did that influence your songwriting style and progression as a musician? GEORGE: Massively. EPs and the album, a lot of the songs have come from that [experience]. The majority of them actually. It was the first time that I went out and did anything actually on my own, and I think it was really important for me to have done that and to have experienced. It turns out I can actually spend some time by myself and I quite like it, I never knew that before. CDM: Were there any particular experiences that stood out? GEORGE: The last stop was Paris, and I ended up having to sleep in a little doorway - that stuck out. I ended up having to sleep in the hospital, and that was an experience. CDM: Why did you have to sleep in the hospital?! GEORGE: <laughs> 'Cuz I had no money left and none of the hostels would let me in. I went and asked the hospital if I could sleep in there and they let me! CDM: How does the George Ezra songwriting process work? GEORGE: There's not much to it when it comes to structure. I sort of write down a lot of things - what I do and who I meet - and when I'm playing guitar, I just try and put those words into lyrics and just try a few things. It's all over the place. CDM: The thing I really appreciate about your music is that it seems to be an honest interpretation and reconstruction of society and things so you personally see and hear - is that important to you when you're writing and creating a song? GEORGE: Yeah. I like to try and mix diction and experiences, and if you can mix them with everything going on as well… that's what I'm always trying to do to get a good balance. CDM: What do you think is the different between a good song and a great song? GEORGE: That's a really good question. The thing for me though, is that songs are good depending on the memories I have with them. So even if I know that really it's not a great song, even if it's a naff song but I have a good memory of it, then to me that's a great song. CDM: Can you explain a little bit about the 'Marky Ramone scar on your head' story? CDM: That's pretty much a mash-up of the Harry Potter plot, aside from the fact you didn't go through to Platform 9 3/4. CDM: Because I feel like the kid being left out of the cool club, and think that it's a word I should potentially use more often, what does 'Petan' mean?! You hashtag it all over Twitter! GEORGE: It's a word that we sort of made up and it's meant to be used for everything. It's hard to explain, but do you ever get one of those words that can fit into many contexts? It can be positive or negative… and now though it's sort of become something that means more to my fans. It's like a header for 'George Ezra'. CDM: What have been some of the most important lessons you learnt from your early experiences of the music industry? GEORGE: I think the lesson that I learnt very early on was to listen to people you work with, because you're all in it together. They're trying to work toward creating the best records they can. I think one of the worst things people can do is try and fight the people they've agreed to work with. If you sign a record deal then you're agreeing to work with them, and you should remember that. I think also to stand your ground, everyone has their opinion, but I think if you truly believe that something should be that way then you should push for that. CDM: I saw that you sold out your Electric Ballroom gig in London AND have already had a UK tour sell out - that's awesome! Does it feel surreal to be selling out your own headline shows across Europe? GEORGE: I guess so. It's strange to think that I can go places and people want to hear my music. I guess that's all I ever wanted, so yeah. No doubt, I'm chuffed. CDM: I heard that there were even people running over to you singing your lyrics when you played the BBC Introducing Stage at Glastonbury! What was that like? GEORGE: Uhhmm, amazing! I was quite nervous before that gig 'cuz it's a pretty big festival. I didn't know what to expect. But yeah, people were there. People knew the words and that's all you can ever ask for. It's amazing. CDM: I personally love the uplifting romanticism of your single 'Budapest', what's the story behind the song? GEORGE: When I went travelling around Europe there was the Eurovision song contest on, and I got a bit dunk and we missed our train to Budapest the next day. Anyway, when I got back I kind of realised how many songs there were about people giving up things for somebody, so I thought I'd make a song about giving up things I don't have. These elaborate things that I don't have that I could give up to somebody, and I kind of thought there was kind of some sweet sentiment in that. GEORGE: <laughs> Well that was also while I was travelling and I kind of had the classic realisation - that I guess most teenagers have at some point - that time's gonna run out and that's not in my power to change that. As soon as I had that thought I laughed at myself in shame, and I started writing verses to take the mick out of that. CDM: Can you give us any clues as to what we can expect from your album and when we can hear it? GEORGE: The whole point is that the two EPs that I've released is to get to ease people into me having a band, because obviously I still gig on my own, but I've always heard my music with a band. The EPs give a good indication of where it's going. I'm hoping to release it June or July when the song's out in England hopefully - I doubt it, but hopefully. I think it's gonna be a good festival album. I think it's gonna be perfect for the sun and lukewarm cider. GEORGE: The only thing you can ever ask for is that, like what I was saying with memories, that somehow my music can fit into somebody's memory. If it can be the soundtrack to somebody's happy days then that would be amazing. CDM: Lyrically, what's your favourite song that you've ever written and why? GEORGE: Oh wow. I dunno, 'cuz lyrics are a big thing for me and I'm interested in making sure they're as good as they can be. There's a song called 'Drawing Board' that might be on the album, I'm not sure yet. If you ever hear 'Drawing Board', that's probably my favourite lyrically. I like all of them! CDM: What was the first song you ever wrote and what was it about? GEORGE: <laughs> I was about thirteen, and luckily there's no recording of that song. I remember it was called 'Wishing Well', I don't remember what it was about, but I can imagine it wasn't my finest hour. CDM: Lastly, what's left on your bucket-list that you'd really like to achieve? …And then the phone died. George Ezra’s debut album, 'Wanted On Voyage', is out in New Zealand on June 27th. Click HERE to pre-order now via iTunes. MusicGeorge Ezra - 'Barcelona' music video. 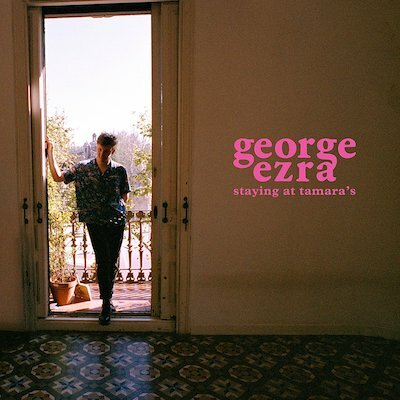 MusicGeorge Ezra covering Cyndi Lauper's 'Girls Just Wanna Have Fun'. MusicGeorge Ezra covers Macy Gray 'I Try' in the Live Lounge. MusicGeorge Ezra announce SITG 2017 sideshows for Sydney & Melbourne.